Secure management and database for multiple MantaProbes and the PSAPs they serve. How you get the complete view of the systems at all of your PSAPs. Every PSAP equipped with a MantaProbe has a database entry on the MantaServer that includes details about the PSAP and the MantaProbe that is installed there. MantaProbe configurations are stored on the MantaServer and if a MantaProbe ever needs to be replaced, the configuration can be downloaded to automatically configure the replacement MantaProbe. The MantaProbe alarm settings are stored in MantaServer libraries. Pre-defined alarm configurations can be downloaded from the MantaServer to a MantaProbe. MantaProbes contact the MantaServer on a regular basis to verify availability. The MantaServer alerts users if connections to a MantaProbe have been lost. The MantaServer maintains a database of authorized MantaSystem users. The database includes permissions for access to various MantaServer functions as well as membership in groups of MantaProbes. MantaProbe groups determine which users can access specific MantaProbes and what they can do when they access the probe. Authorized vendor employees may be added to the user database so that they can use the features of the MantaProbe to securely interact with their Customer Premises Equipment. Interactions can include file transfers as well as terminal console access. All user access to the MantaProbes is logged. • Evaluating the alarm for classification into one of up to five color-coded categories. • Transmitting it to other redundant MantaServers to keep the alarm databases in sync. • Displaying the alarm on alarm summary screens. • Displaying the alarm on a map at users’ workstations. After the alarm has been processed and is stored in the “active” alarm database, responsibility for its disposition may be assigned to a technician. Alarms may be automatically assigned if a technician chooses to use the alarm menu to connect to the MantaProbe or it may be manually accepted by a registered user. When the alarm has been resolved, users may clear them individually or as part of a group with similar characteristics. 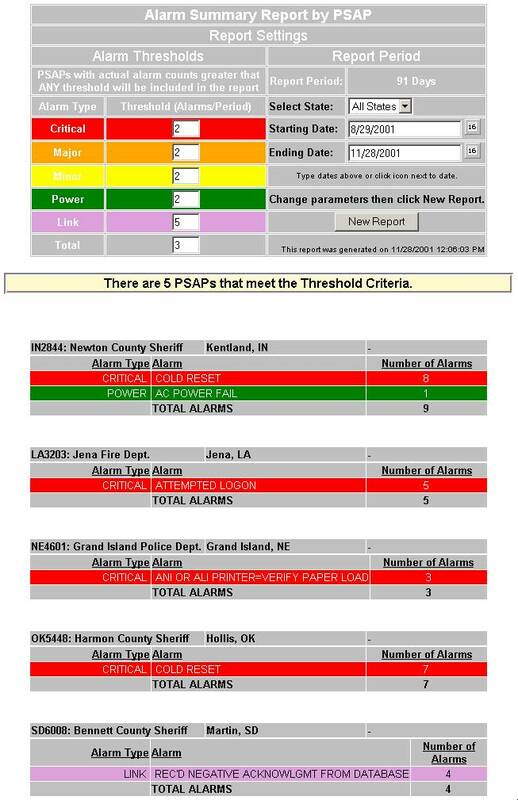 When cleared, alarms become part of the archived alarm database where they are available for reports or other analysis. Alarms are stored in an SQL database and are available for any user-defined SQL queries. The “Alarm Summary Report” is included in the MantaServer and provides a comprehensive alarm report based on user-defined thresholds. Any authorized MantaServer user may view a map of the covered region that includes a dynamic display of active alarms, color coded by category. This provides a visual summary of all active alarms that can suggest certain kinds of network events. 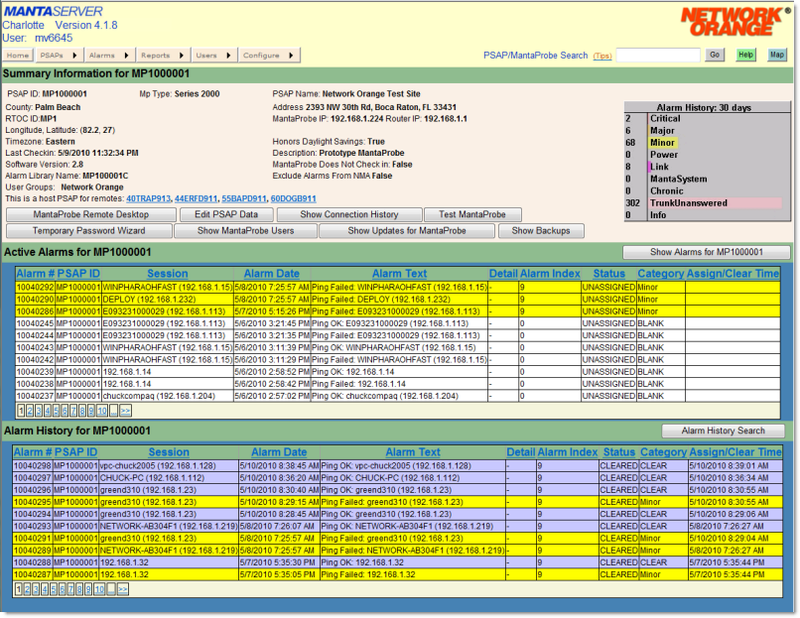 Clicking on colored alarm dots opens a PSAP summary screen or, alternatively, establishes real-time connectivity to the corresponding MantaProbe. The MantaServer provides an NTP standard time source to all MantaProbes who can provide it to PSAP systems that don’t have Internet connectivity or access to an NTP time source.